This is a group for people who support the goals and ideals of Amnesty International and their members. 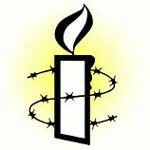 As this site is not officially connected with Amnesty International, the views and opinions expressed here or the actions and decisions of the hosts are their own, and may not reflect that of the organization. We hope for this group to be a powerful forum for people to discuss Amnesty International's work and encourage active participation from all our members. Please note that as this forum is for those in support of Amnesty International's work, we request that people who do not support this organization, or who disagree with their work refrain from disrupting the group. Thanks, and enjoy the group!